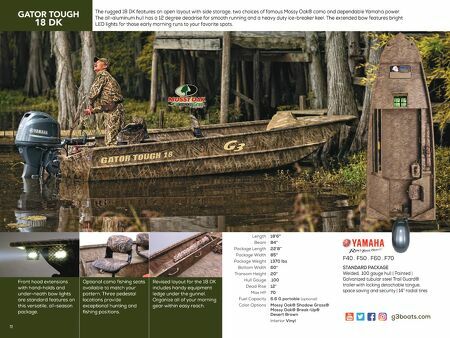 g3boats.com The rugged 18 DK features an open layout with side storage, two choices of famous Mossy Oak® camo and dependable Yamaha power. The all-aluminum hull has a 12 degree deadrise for smooth running and a heavy duty ice-breaker keel. The extended bow features bright LED lights for those early morning runs to your favorite spots. STANDARD PACKAGE Welded, .100 gauge hull | Painted | Galvanized tubular steel Trail Guard® trailer with locking detachable tongue, space saving and security | 14" radial tires Front hood extensions with hand-holds and under-neath bow lights are standard features on this versatile, all-season package. F40 . F50 . F60 . F70 18'6" 84" 22'8" 85" 1370 lbs 60" 20" .100 12° 70 6.6 G portable (optional) Mossy Oak® Shadow Grass® Mossy Oak® Break-Up® Desert Brown Interior Vinyl Length Beam Package Length Package Width Package Weight Bottom Width Transom Height Hull Gauge Dead Rise Max HP Fuel Capacity Color Options 72 Revised layout for the 18 DK includes handy equipment ledge under the gunnel. Organize all of your morning gear within easy reach. 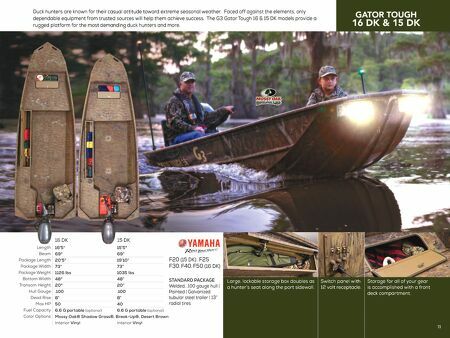 Optional camo fishing seats available to match your pattern. Three pedestal locations provide exceptional hunting and fishing positions.